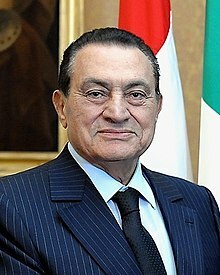 ^ Air Marshal Mohammed Hosni Mubarak. Egyptian Armed Forces Web Site. Egyptian Armed Forces. [2009-05-30]. （原始内容存档于2010-03-23）. ^ 4.0 4.1 穆巴拉克被判终身监禁. 新华网. 2012-06-02. ^ 5.0 5.1 穆巴拉克涉谋杀示威者案做出终审判决 被判无罪释放(高清组图). 国际在线. [2014-11-29]. ^ 6.0 6.1 Egypt's Hosni Mubarak freed after six years in detention. BBC News. 24 March 2017 [24 March 2017] （英国英语）. ^ 埃及前总统穆巴拉克获释. 新华网. 2017-03-25 [2018-12-19].